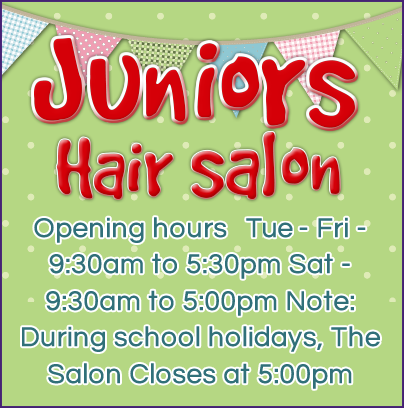 At Juniors we're Mums too, so we've thought of everything to make your and your children's visit to our hair salon a fun and enjoyable experience. Holidays are our busy period so book now to avoid long waits. Head over the booking page. We'll look forward to hearing from you. Highly experienced, qualified and friendly staff. Play areas and toys for the kids, including our enormous train tracks! Televisions, DVDs and videos to keep them amused while they wait and then while they have their hair cut. Brightly decorated salon with special chairs. Treats as rewards for the kids after mission accomplished! And of course, great haircuts from some of the best in the business! For the girls and indeed the Mums we offer top quality haircuts in a lovely atmosphere for a fraction of the cost of many 'ladies' salons. All our staff are fully qualified and very experienced. No need for babysitters either! Even if you have smaller children with you; don't worry, they can play happily in the safe play area while you relax and have your hair cut. There's also our really popular Miss Makeover Pamper parties for all young ladies aged 5 and over. Choose an Original Themed party or for older girls a glitzy VIP party or the ultimate treat of a Luxury Spa Party. - see our parties page. Older Boys and Dads too! Our stylists are also fully trained, experienced barbers. Feel relaxed in our pleasant surroundings (not like your normal barbers!) Watch a sports DVD or the, "footie," while our stylists do their stuff. You can also pre-book so no long queues! 22/07/2015- We are extremely happy to welcome back our stylist Becky! She will be working in the salon every Friday!